Happy the peacemakers: they shall be called Sons of God. The Gospel of Christ is a Gospel of peace. And the driving force of evangelical peace is truth. Jesus revealed to man the full truth about man; he restores man to the truth about himself by reconciling him with himself and by reconciling him with others. Truth is the driving power of peace because it reveals and brings about the unity of man with God, with himself and with others. Forgiveness and reconciliation are constitutive elements of the truth which strengthen peace and which builds up peace. To refuse forgiveness and reconciliation is for us to lie and to enter into the murderous logic of falsehood. Our Lady of Ostra Brama (Polish Matka Boska Ostrobramska) is one of the effigies of Virgin Mary that is venerated in many places, most notably in Poland. 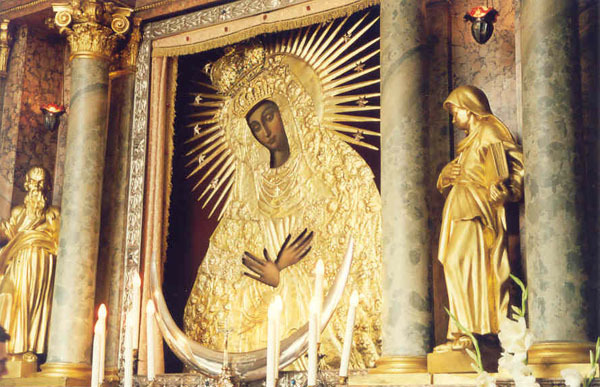 There are several shrines with copies of the original Our Lady of Ostra Brama painting located in the Ostra Brama Chapel in Vilnius, Lithuania. The original painting is 163 x 200 cm large and was painted by an unknown artist on 8 oak planks around 1630. It was covered with silver and golden face around 1671 and on July 2, 1927 cardinal Aleksander Kakowski crowned the effigy with a double crown, as a symbol that Holy Mary is the queen both of Heaven and of Poland. After the World War II, when most of Polish inhabitants of Wilno were expelled from the city, the cult of the holy icon was continued abroad in many shrines to the Virgin Mary, most notably in Bia³ystok, Drogosze, Kêtrzyn, Olsztyn, Skar¿ysko-Kamienna and Wroc³aw. The biggest of the churches devoted to Our Lady of Ostra Brama is St. Mary's Church in Gdañsk. There are also several other churches devoted to Our Lady of Ostra Brama in the United Kingdom (Kidderminster), USA and Australia. One of the most popular Marian shrines of Eastern Europe is found in the Lithuanian capital Vilnius. Thy beauty whole, because I yearn for thee. The history of Our Lady of the Dawn, who is also known as Our Lady of Ostra Brama, begins in 1386. In that year prince Władysław Jagiełło (1351 - 1434) of Lithuania married the Polish princess Jadwiga. As part of the contact for marriage Jagiełło pledged the conversion of the Lithuanian people to Christianity. The marriage resulted in the joining of Poland and Lithuania into a Commonwealth of Nations. With the advent of Christianity, Marian devotions were introduced by princess Jadwiga. The people of Lithuania welcomed these devotions and pious practices with open arms. The Polish-Lithuanian Commonwealth (or The Commonwealth of the Two Nations, Rzeczpospolita Oboja Narodów in Polish) was a federal monarchy-republic formed by the Kingdom of Poland and Grand Duchy of Lithuania, between 1569 and 1795, which was governed by an elected monarch. Duchy of Prussia or Ducal Prussia (1525–1657 as a fief of Poland) Note that two Prussias existed beside each other: Royal Prussia was held by the king of Poland, who also was the feudal lord of Ducal Prussia. Early in the fifteenth century, the new city walls of Vilnius were built. Above each of the gates the people of the town placed an image of the Blessed Virgin. About a century later, the Carmelite Order took over one of the parish churches in the vicinity of the southeastern gate of the town. 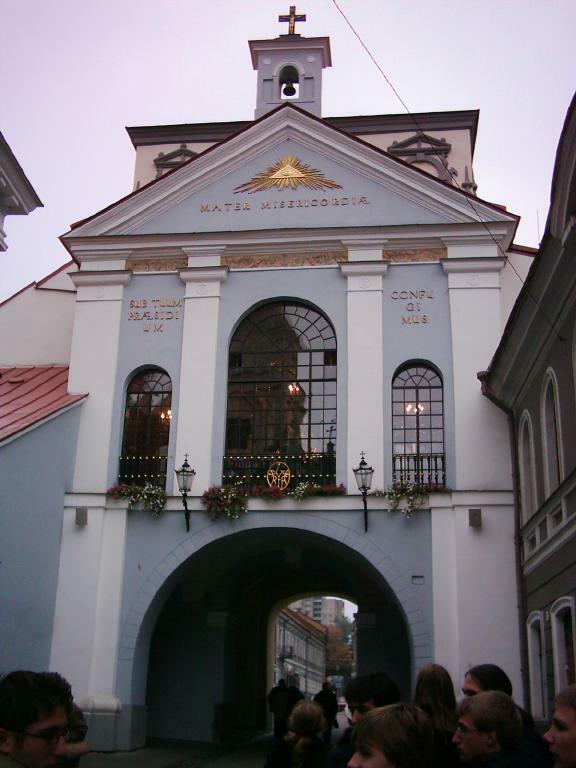 In the Lithuanian language this gate was commonly known as 'Auros Vartai' (the gate of dawn). The Polish speaking population knew it as 'Ostra Brama' (the sharp gate). The Carmelites are known for their special dedication to the Mother of Jesus. They took special care of the image that was placed above the gate near their church (according to new research, the painting was created in Vilnius between 1620 and 1630 by an unknown artist. It was part of a folding diptych, a two-part painting, showing Christ the Savior on the inside and the Mother of God on the outside). When the army of Moscow set fire to the city of Vilnius in 1655, most of the town was destroyed. The fire lasted seventeen days. However, the image above the Ostra Brama gate survived without any damage. This strongly encouraged the people’s devotion toward it and attracted many pilgrims. In 1711 the Chapel holding the image burned completely, but not before the miraculous painting was carried out of the fire by a young monk. For 20 years, the painting resided in the Church of St. Teresa. A new Chapel was subsequently built by the gate and the miraculous painting was reinstalled with great ceremony. In the year 1761, the Carmelite Father Rosciszewski published "The Story of The Miraculous Painting". During the Insurrection of 1794, Russia, Germany, and Austria attacked Poland and Lithuania in order to suppress freedoms found in the Constitution of May 3rd. During the battle of Vilnius the image and the Chapel were damaged. The damage was fixed the same year. In 1796 the Chapel was renovated once again. The worship of the miraculous painting continued to grow. In 1799 Russian forces began to destroy the walls and gates of Vilnius. Inexplicably the Ostra Brama gate was left untouched. The invocation in Mickiewicz's epic poem Pan Tadeusz, "To The Holy Virgin Shining in Sharp Gate", published in 1834 tremendously popularized the worship of the image. An old chronicle reports that between 1671 and 1761 seventeen (17) miracles took place through the intercession of Our Lady of Ostra Brama . There is one story about a boy who fell from the second floor of a building and was killed. When his mother went to pray before the icon of Our Lady of Ostra Brama, the boy was brought back to life. In 1927, after the renovation of the painting and the chapel, a formal ceremony was held in front of the Cathedral of Vilnius in which the icon was crowned. The chapel was renovated in 1931-1932. During the Second World War and the Nazi German occupation of Lithuania the Archbishop of Vilnius decided that the miraculous picture should stay in the town. During the Russian communist occupation of Lithuania the chapel of Ostra Brama remained open. The Mother of Mercy is a powerful symbol in the struggle for Polish and Lithuanian independence and prayers asking Her intercession as well as pilgrimages to Her shrine continue to be popular.